Being a bystander is a difficult task for someone like me. I typically put my friends needs before my own and love to take care of them, because that’s the point of having friends right? Being appreciated and needed is great and all but what happens when the need is greater than what you can provide? I’m not a doctor, an EMT or even just a mother. I can’t really fix everything for my friends like I wish I could. There comes a point where talking and caring and loving aren’t enough and I can’t do anything else to help. It’s heartbreaking because all I want to do is take away the ailment or the pain or the difficult situation but I can’t. Being close friends with Mer on a day like today is hard. It’s really hard, because you are forced to be that helpless bystander. Today I sat with her through a seizure, through immense amounts of pain and until EMT’s arrived. When you can’t hold her hand and tell her it’s going to be okay because she’s in too much pain, you don’t really know what to do with yourself. Or where to stand to not be in the way. Or what to say. And that in itself is difficult. Then what are you supposed to do? Realize she’s strong, hold it together (or at least try) for her and go home because it’s one of those situations that is out of your hands. At the end of the night she’s back to her (somewhat😉) normal self sending me pictures of dogs and you realize she’s fine. You’re fine. Everyone’s fine. “Modern Medicine”, I dream about a magic pill. Sunday morning is usually pill sorting day in my household, in fact it’s quite the event. To paint the picture of what takes place it’s usually about 4 different pill cases and 11 different prescriptions, once you have the basics you must sort precisely which pill goes in which holder and how much of that pill checking once, twice, and maybe even a third time to make sure you’ve got it all correct. In the beginning of my diagnosis I left this task up to my mom, she knew the doses, I was just the one that swallowed them however I’ve gotten to a point now where I am able to sort, and place the pills in their correct locations. A confusing task indeed that MUST be repeated every week, add the multiple trips to the pharmacy you make in a week for the refills, new medications, and occasional dosage change. To sum it up when one takes an Advil for a headache they use it to relieve the pain, after that it’s gone and probably won’t come back for quite a while. Well when you take someone that’s chronically ill what used to be one Advil is now 28 pills a day and these aren’t little Advil’s they are high strength medications (for example, the medication Zofran, I take for my Gastroparesis is the same pill given to people on Chemotherapy to help ease the pain.) 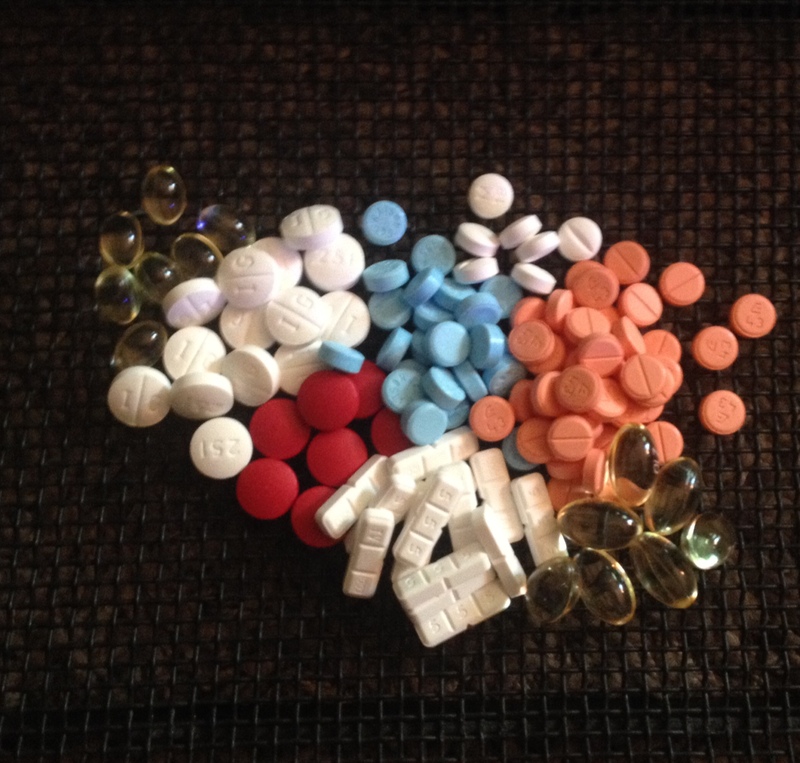 To stress my advocating for a cure for POTS I decided to lay out just how many pills I swallow in ONE WEEK. Like I said, this picture you see is only ONE WEEK worth of pills, that is 127 pills swallowed in one week, 504 in a month, not to mention the other as needed medications. It’s mind boggling to me really that we have all of these medications to treat or at least attempt yet we still have no cure. Even crazier is that most of this dosing is just a guess and check, when one medicine doesn’t work you kick it out and try another one until eventually you either (hopefully) find one that works or are all out of things to try. I often hate to take my pills in public because it’s a reminder to me of how different I am, you just eat food to survive but I, well I rely on these medications. I know in the grand scheme of things I am more that 28 pills a day and it doesn’t define me at all unless I let it but it’s often so hard to wrap your mind around the fact that these medications are essential to your everyday life if you plan on making it out of your bed in the morning. Not only do you just have to take them but with many you have to sit upright for 30 minutes after you take them or you must take them with food or else something else will occur in which you will need another medication to fix. I often more times than not find myself being asked if I took my medicine and usually I will have but every now and then I don’t I like to sit and pretend I don’t need them and imagine what it’s like until I’m then awoken by reality and my mom chimes in and makes sure I have or that nasty wave of dizziness floats over my body as I stand. The point is that I am a face behind “Modern Medicine” and I am a face still waiting for a cure. My voice will not be left unheard and my story will not be left unshared. Modern Medicine doesn’t fix everything and it definitely doesn’t have a magic pill I’ve yearned for and dreamt about however I will continue to fight for one and intend on it until the day I die. As a good friend of mine always says, “Awareness is Key”. My name is Merideth, and I have the guts to tell you what you won’t admit. As many of you realize The Fault In Our stars came out last Friday. A book originally written by John Green that was turned into a movie, and a wonderful movie at that. Many of you read the book and prepared yourself to sit down to the plot of Hazel Grace and Augustus Waters, but for those of you that didn’t you were along to see what others had described as amazing. As the movie played you were introduced to so many emotions laughter, happiness, joy, and then…..sadness. And as the movie ended you were left with a blank face, for those of you that cried wether you related to the movie or not something hit you, and for those whose jaws were dropped open because the words couldn’t quite form the right pattern of words to express your feelings. Others left with a smile, what a sweet love story. But that’s not the truth. The fact of the matter is that CANCER EXISTS. And as you walk out of that movie theatre it’s all left on that Hollywood screen, movie stars portraying a story. It’s just a movie to you and nothing more. CANCER EXISTS and wether you have it or not you are bound to run into someone with it or even in 10 years as you find yourself on your death bed because of a disease inside your own body. Yes it won’t happen to you keep telling yourself that and you’ll be okay, and if you get it it will all be okay you can have a love story and you will be alright. But that’s not the truth the truth is that Children with Cancer only get 3.8% of funding from the government and the truth is that we have been using the same tactics to diagnose cancer for YEARS because there’s not enough funding and research. The truth is that 4 out of 10 people who are diagnosed with cancer this year are predicted to be alive five years later. The truth is that each year around 14 MILLION people find out they have cancer and each year about 8 MILLION die from it. That’s over half that are diagnosed……gone. And the sad thing is that to most of us today Cancer is just a word. It’s a noun, a “thing”. Cancer is more than diagnosis to a Hollywood character in a movie, it’s more than the beginnings of a love story. The truth is that there is no proven cure today that will kill and guarantee NED (no evidence of disease) for the rest of your life. There isn’t a magic pill to that takes away the pain and there isn’t a bandaid to cover up the hurt. CANCER EXISTS AND IT KILLS. And it does not have to be that way. But until we stand as a nation and fight the epidemic cancer will be no more than a thing but it’s bound to be something because it’s predicted that by 2030 the global number of deaths from cancer will be 80% and one of those very well could end up being you…….so make a difference get involved and help defy the statistics. CANCER EXISTS and CANCER KILLS but it does not have to.